Think about it this way – lifting weights and spending an hour on the treadmill or bike can get boring pretty quickly. Why not challenge yourself? Martial Arts constantly stimulates your mind and body making each lesson exciting. Classes will improve your fitness, help you lose weight, and help improve your posture, flexibility and muscular strength and endurance. To top it off, you’re learning a practical skill that will help improve your awareness, reflexes, and coordination (just to name a few!). All of our classes are fun, motivating and safe. Our family environment creates a strong sense of unity as each member encourages one another to improve their skills and fitness. This ‘positive peer pressure’ will help you reach your goals, set new goals, and make new friends along the way. Private classes with our expert instructors are also available for those who want that personal service and convenience. There are many proven benefits that Martial Arts have to offer adults. They include – More Energy and Greater Productivity, Discipline and Focus, Goal Achievement, Self Confidence, Self Defence, and Leadership. Billionaire Sir Richard Branson was asked “How do you increase your productivity?” His answer was one word - “Exercise”. He went on to say that exercise keeps the endorphins going, the brain functioning well, and by exercising he can achieve twice as much in a day by keeping fit. What better way to exercise than Martial Arts. Martial Arts helps burn fat and calories, builds strength, strips away stress and gives you a little ‘competition’ in your athletic life. With the advancements of technology we can now eat our breakfast while reading our emails while at the same time watching television. Our focus shifts from one thing to another constantly. Because of this we lack a valued character trait which is focus. Martial arts will help give you a short break from the digital demands and improve your powers of concentration. Focus is taught through rhythmic breathing and relaxation, step by step repetitive movements, personal attention, positive reinforcement and adherence to etiquette. All of us strive towards career related goals, but not many strive towards mental and physical goals. With the martial arts, no matter your age of ability, you are constantly striving towards personal goals of achievement. Studies have linked self confidence with career advancement, success in relationships and productivity. With martial arts, as you progress through the belt ranks, you become more confident in your ability to defend yourself. Martial arts helps you build confidence by encouraging you to succeed. When you’re self assured, you approach more challenges with an ‘I can do it’ attitude. Martial Arts is fun, exciting and a great way to stay in shape. But don’t forget that martial arts also teaches you self defence skills. You will experience improvements in your agility, balance, endurance, flexibility and even strength. Martial arts will teach you not only HOW to defend yourself, but also how to AVOID physical confrontations. If you’re going to spend time exercising, why not learn a skill at the same time? 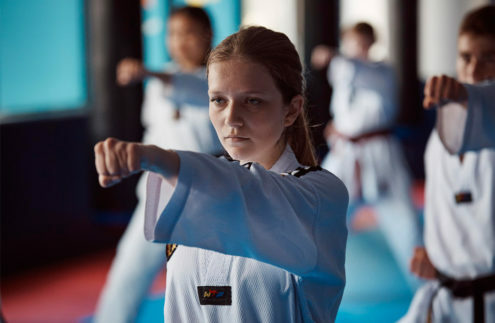 As a culmination of the previous benefits of martial arts – energy and productivity, focus, goal achievement, self confidence and self defence – comes Leadership. All the above mentioned traits are attributes of a leader. Speaking in front of a group and communicate effectively, setting good examples for others, mentoring lower ranks to succeed, these are all qualities of a leader. I have trained here for about 2 years now. I have lost over 20kg, gained confidence, humbleness, met some fantastic people and learned serious Muay Thai techniques and conditioning.